Spelt pretzels are another great high-fiber, easy snack. Pretzels are baked, so pretzels in general are a healthier snack than deep-fried chips. Spelt pretzels give you the additional Benefits of whole grains. Eighteen spelt pretzels provide 110 calories, 21 g carbohydrate, 4 g protein, 1.5 g fat, 4 g dietary fiber, 240 mg sodium, and 0.36 mg iron. Eating sprouted grains is like eating a whole little plant�combining the nutrition of a grain with that of a green vegetable. Some breads made with sprouted grains also include sprouted legumes; some have no flour; some are made without yeast. Most sprouted grain breads are made with ingredients as unrefined as possible. 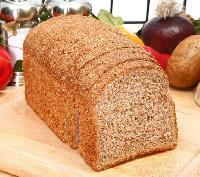 Sprouted grain breads tend to have a low glycemic index and to be low in saturated fat. The sprouted grains used most often for these breads are wheat, millet, and spelt. The breads that incorporate legumes use sprouted lentils and sprouted soybeans, making the bread a complete protein. One slice of typical sprouted grain bread provides 80 calories, 15 g carbohydrate, 8 g protein, 0.5 g fat, 3 g dietary fiber, 75 mg sodium, 80 mg potassium, 0.72 mg iron, 0.12 mg thiamine, 0.03 mg riboflavin, 0.4 mg niacin, 0.08 mg vitamin B6, 24 mg magnesium, and 0.6 mg zinc. 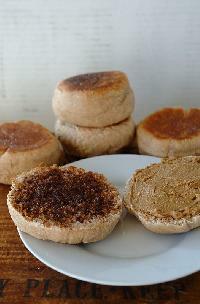 Sprouted grain or whole wheat English muffins are a great, high-fiber replacement for white bread English muffins�and much more satisfying. This is a fantastic staple starch to keep on hand as the basis for a quick breakfast, lunch, or dinner. For a more balanced meal, add a protein source and vegetables. One half of a sprouted grain English muffin provides 80 calories, 15 g carbohydrate, 4 g protein, 0.5 g fat, 3 g dietary fiber, 80 mg sodium, and 75 mg potassium. Sprouted grain tortillas are a high-fiber, versatile staple food to keep in your re- frigerator for a quick breakfast, lunch, or dinner. These tortillas are great to use for wraps, egg burritos, and vegetarian burritos. One sprouted grain tortilla provides 150 calories, 24 g carbohydrate, 6 g protein, 3.5 g fat, 5 g dietary fiber, 150 mg potassium, 140 mg sodium, 4 mg calcium, 1.8 mg iron, 0.22 mg thiamine, and 40 mg magnesium. Teff is the tiny grain from which Ethiopian injera bread is made. Teff is also popular in India and Australia, and it is now being grown in the United States, primarily in Idaho. Teff is so small that the bran and germ�the parts in most grains that contain most of the nutritional value�make up almost the entire grain. As a result, teff is exceptionally high in fiber. Teff also provides all eight essential amino acids, making it a complete protein. It is a gluten-free grain. Teff is a good source of several minerals, including calcium, phosphorus, iron, copper, aluminum, barium, magnesium, boron, and zinc. The iron in teff is in a form that is relatively easy for the body to absorb (unlike many other plant-based iron sources). Teff also provides thiamine, and more lysine than either wheat or barley. One-quarter cup of dry whole grain teff provides 160 calories, 33 g carbohydrate, 6 g protein, 1 g fat, 6 g dietary fiber, 10 mg sodium, 80 mg calcium, and 3.6 mg iron. Triticale was developed as a wheat-rye hybrid to take advantage of rye�s hardiness and wheat�s high yields. Triticale is also high in protein and has twice the lysine of wheat. 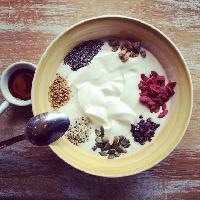 High in fiber as well, triticale also provides potassium, phosphorus, magnesium, manganese, and B vitamins. One-half cup of whole grain triticale flour provides 219 calories, 47.7 g carbohydrate, 8.5 g protein, 1.2 g fat, 9.5 g dietary fiber, 48 mcg folic acid, 303 mg potassium, 208.5 mg phosphorus, 23 mg calcium, 99.5 mg magnesium, 1.73 mg zinc, and 2.72 mg manganese. Wheat germ provides vitamin E, folate, phosphorus, thiamine, zinc, and magnesium. It is also a good source of fiber. Wheat germ contains more iron and potassium than almost any other food. A 3.5-ounce portion contains 9.5 mg of iron, 827 mg of potassium, 2 mg of vitamin B1, and 4.2 mg of vitamin B3. The active elements in wheat germ are vitamin E and the essential fatty acids. One of the fatty acids in wheat germ, octacosanol, appears to help increase endurance and improve the utilization of oxygen during exercise. It may also help reduce cholesterol in the blood and be useful in treating Parkinson�s disease. Oil derived from wheat germ improves strength and increases longevity. Two tablespoons of wheat germ provides 48 calories, 6.4 g carbohydrate, 4.1 g protein, 1.2 g fat, 1.6 g dietary fiber, 17 IU vitamin A, 51 mcg folic acid, 143 mg potassium, 147 mg phosphorus, 7 mg calcium, 41 mg magnesium, and 2.08 mg zinc. 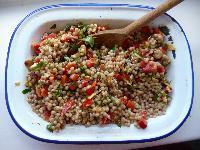 Whole wheat couscous is a quick-to-make, satisfying, high-fiber starch. It is a great low-fat source of complex carbohydrates�the body�s optimal fuel�and a nice alternative to rice and pasta. Made of bits of wheat moistened and rolled in wheat flour, this Middle Eastern food is not quite a grain and not quite a pasta. One-third cup of whole wheat couscous provides 190 calories, 43 g carbohydrate, 7 g protein, 1 g fat, 7 g dietary fiber, and 1.08 mg iron. Whole grain crackers, flatbreads, and crispbreads provide a portable, crunchy whole grain with the convenience of a prepared food. High in fiber and low in fat, they come in a variety of flavors that feature different grains and seeds. 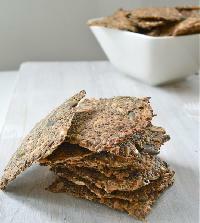 Five whole wheat crackers provide 115 calories, 19 g carbohydrate, 5 g protein, 2 g fat, 4 g dietary fiber, and 1.4 g iron. Whole wheat pasta brings the Benefits of whole grain to a familiar staple. Providing complex carbohydrates, fiber, manganese, and magnesium, whole wheat pasta lets you enjoy your favorite pasta dishes while helping to regulate blood sugar and protect intestinal health. One cup of cooked whole wheat pasta provides 174 calories, 37.2 g carbohydrate, 7.5 g protein, 0.8 g fat, and 3.9 g dietary fiber.